Can Sarah Palin Win the Gold With Republican Endorsements? Thus far, the former VP candidate Sarah Palin has endorsed four Senate candidates in competitive Republican primaries. All four have won. Tomorrow, she could extend that winning streak to five if Republican former Missouri state Treasurer Sarah Steelman, for whom Palin stumped this weekend, wins a three-way GOP primary contest. Like any good athlete, Palin has an impeccable sense of timing. And, she’s keenly aware of the environment in which she’s competing. Despite the fact that the Tea Party failed to field a credible presidential candidate, the mood of the GOP primary electorate remains as anti-establishment as ever. Palin is clearly aware of this. She has sided with the non-establishment candidate in each of the four contests. Even her endorsement of long-term incumbent Sen. Orrin Hatch is not the outlier that it looks like at first glance. Having learned the lessons of 2010, Hatch’s campaign worked hard to woo Tea Party types. He re-packaged himself as an uncompromising partisan fighter. He may not have been a Tea Party candidate back in 2008, but he sure acted like one in 2012. Also helping to fuel Palin’s success is the fact that she tends to wait until late in the game to bestow her blessing on a candidate. Her political fundraising arm, SarahPAC, donated to Indiana’s Richard Mourdock just eleven days before his Republican primary victory over Sen. Richard Lugar. The PAC gave $5,000 to Nebraska’s Deb Fisher just four days before her primary. And in Texas, where Ted Cruz upset GOP Lt. Gov. David Dewhurst, Palin’s PAC sent a check 18 days before the May 29 primary. But a check from Palin is less important than her voice. “The important thing is she’s had a tremendous impact with no money. She doesn’t lead with her chin. It’s not about her writing checks, it’s about her presence and her commitment,” said Steve Bannon, a Palin friend and the Executive Chairman of the conservative website Breitbart News. 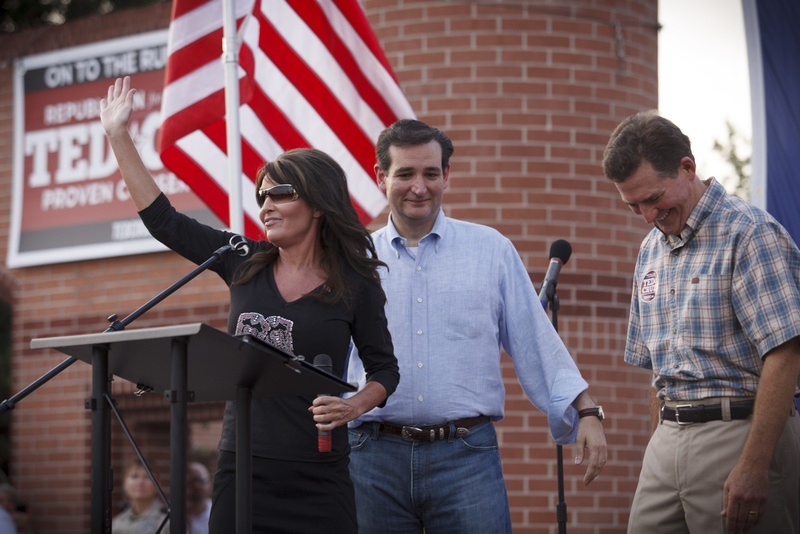 Bannon said it is no accident that Palin is endorsing more candidates in Senate races. “She’s focused on the senate. That’s where she’s putting her effort…Obviously they are winning, but I don’t think it’s just about winning, it’s about sending a message. Even if the streak comes to an end she’s backing anti establishment people,” he said. ‘Stars Earn Stripes’ Premieres Monday, August 13! Todd Palin, Terry Crews, and Brent Gleason discuss the personal impact of their participation in the ‘Stars Earn Stripes’ series, in which they sometimes faced life-threatening situations during the training and filming. The two-hour series will premiere at 8 PM EST on Monday, August 13.